Trocer Spray: Each metered dose spray contains Nitroglycerin BP 400 mcg. Nitroglycerin Spray act on smooth muscle of blood vessels. It dilates the peripheral veins, arteries, coronary vessels, thereby decreases cardiac pre and afterload, cardiac work oxygen demand. It also reduces venous return, lowers end-diastolic pressure in the right and left ventricles and improves myocardial function. Nitroglycerin Spray increases the tolerance of anginal patients to exercise. Nitroglycerin applied on the buccal mucosa is absorbed quickly; its effect becomes apparent within 1 minute. Nitroglycerin spray is indicated for acute relief of an attack or prophylaxis of angina pectoris due to acute left ventricular failure or coronary artery disease. In case of attack one or two doses should be administered under the tongue to a sitting patient. If necessary, more doses can be given but not more than 3 doses within 15 minutes. For prevention one dose should be applied 5-10 minutes before physical exercise. Use in Children: Nitroglycerin Spray is not recommended for children. 1. Sit down if possible as soon as you feel an attack of angina coming on. 2. Remove the plastic cap, do not shake the container. 3. Hold the container upright with forefinger on top of the white button. 4. Open the mouth and bring the container as close to it as possible, aiming it under the tongue. 7. If you require a second administration to obtain relief, repeat steps 4, 5 & 6. Put the plastic cap in position. 1. 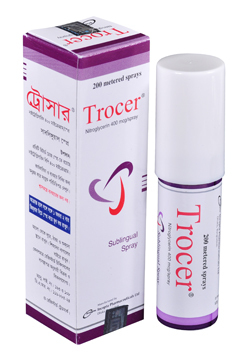 In case of angina patients, it is important to carry Trocer (Nitroglycerin) Spray all times (We recommend keeping a second supply at home on bedside table or wherever it can be reached easily). 2. This drug is not for routine use. It is only to be used at the onset of chest pain. 3. Do not drink alcoholic beverages after taking this medication. 4. Keep in safe place away from children. 5. DO NOT take sildenafil, vardenafil or tadalafil while using any nitroglycerin product. Using these drugs together can result in severe lowering of blood pressure, loss of consciousness, heart attack or death. A number of nitrate related adverse effects may occur like, burning sensation in the mouth, headache, facial flashing, dizziness, nausea, vomiting, sweating , palpitation, sensation of heat, postural hypotension and reflex tachycardia. There is no evidence relating to the safety of nitrates in pregnancy and lactation. Therefore, Nitroglycerin Spray may be used in pregnancy and lactation only when considered essential by the physician.